Federal prosecutors and the FBI are set to join the inquiry into what happened to hundreds of millions of dollars invested with a securities firm headed by former New Jersey Gov. Jon Corzine, officials familiar with the case told NBC New York. The Justice Department involvement comes as the Securities and Exchange Commission and the Commodities Future Trading Commission have said their own inquiry is underway into the collapse of the brokerage firm, MF Global Holdings Ltd. The head of the Chicago Mercantile exchange said Tuesday that the firm broke rules requiring it to keep clients’ money and company funds in separate accounts. U.S. Attorney Preet Bharara declined to comment Tuesday as did DOJ spokesmen in New York and Washington. An FBI spokesman also declined to comment. An SEC spokesman said there are “possible deficiencies in customer futures segregated accounts held at the firm.” The Securities Investor Protection Corporation has announced liquidation of MF Global is now underway. The former governor and U.S. senator who served on the Senate Banking Committee has not been charged with any wrongdoing. But there are questions as to whether the firm improperly used hundreds of millions of client money to cover bets made by the firm. 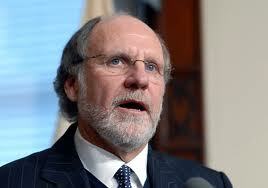 Corzine had been seeking to sell his firm in recent days but potential bidders backed out. According to the New York Times, one firm, Interactive Brokers, discovered client investments appeared to be missing, and abandoned its deal.